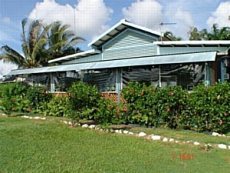 Fishing accommodation in Darwin and nearby Northern Territory fishing locations for beach accommodation, fishing tours, boat hire or camping. The fishing is so good here people travel from around the world just so they can go fishing. Northern Territory barramundi are famous for their size and fighting power, a great sport fish. Anglers accommodation is specially catered at several locations with facilities ranging from luxury wilderness lodges to caravan parks and camping grounds. Accommodation for up to 12 people at the remote Cape Don lighthouse on the Coburg Peninsular. The lighthouse was built in 1916, now the Head Lighthouse Keeper's homestead is fitted with modern facilities offering the charm of the past era and the comfort required after a day of fishing or adventure in this remote locality. The resort has a fleet of 6 fishing boats of various sizes and provides expert guides to ensure you make the most of the wide variety of fish found through this diverse ecosystem. Access is by light aircraft, with a flight from Darwin taking about 45 minutes. Located on Melville Island in the Tiwi Island Group.With unspoiled fishing as it was 0ver 100 years ago.Where the Barramundi, Reef fishing, fly fishing and all fishing is good as it gets. 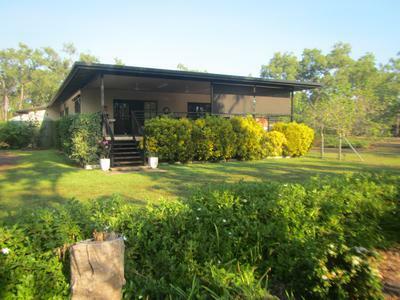 Rated as one of the top 5 fishing lodges in Australia. Here you can also experience aboriginal culturebush tucker, island exploring, traditional huntingand the many other activities that Melville Island's Munupi Lodge has to offer. Melville Island is the largest island in Australia next to Tasmania. Only about 20 kilometres from the mainland at its closest point, it is separated from the smaller Bathurst Island by the narrow Apsley Straight which divides the islands north south. Crab Claw offers accommodation from beach front cabins to camping and caravan facilities. Located just 130 kms south-west of Darwin on Bynoe Harbour, Crab Claw is an island at high tide, approximately 1 1/2 hours drive from Darwin in a conventional 4WD vehicle. An ideal spot for Barramundi, Threadfin Salmon, Jewfish, Trevally, Mangrove Jack, as well as a variety of reef fish or the elusive Sailfish. With over 30 species of fish, you may want time out to catch one of the monster Mud Crabs. There are guides available, as well as a number of fishing packages from local services and 4 meter hire boats suitable for 4 people. One day cruises to Crab Claw are available during the dry season. Is this the ulitimate fishing accommodation? Live on the water and save traveling to the fish. NT Luxury Houseboats Darwin provide value holiday accommodation at King Ash Bay and Darwin Harbour. Enjoy the excellent facilities, affordable rates and breathtaking scenery from your own private houseboat. NT Luxury Houseboats are the perfect way to relax with family and friends. Houseboats are ideal for day trips for your group of up to 30 people. NT Luxury Houseboats each feature three spacious decks, a modern galley, outdoor barbeque setting & luxury spa bath. The interiors are air-conditioned, with ample seating and a television with DVD player. The NT Luxury Houseboats new boat can sleep up to 12 people comfortably. NT Luxury Houseboats are excellent for fishing trips. NT Luxury Houseboats also give you the option to hire a 4.5m Tender for Day Fishing trips from the boat. Return from Darwin Fishing Accommodation to Enjoy Darwin Home.